Reliable immobilization of biomolecules on sensor surfaces is a key approach for biomolecular kinetic studies. The unique sensor functionalization protocol of switchSENSE® technology allows to regenerate the sensor multiple times and supports a wide range of ligand immobilization methods, such as covalent coupling and capturing. Here, we measure the kinetic rates for the capturing of Twin-Strep-tag® and Strep-tag®II proteins by Strep-Tactin®XT. Subsequently, we analyze the well-studied interaction between protein A and adalimumab (Humira) using Twin-Strep-tag® capturing to show its applicability for the quantification of tight interactions with slow off-rates. The Twin-Strep-tag® features a pM dissociation constant and overcomes up-to-date limitations of capture techniques. 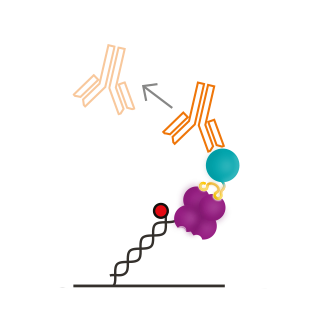 For the first time, the Twin-Strep-tag®/Strep-Tactin®XT system enables the kinetic analysis of strong binders with long dissociation times without the need for covalent coupling.